The Hartland landfill faces a revenue shortage. The $107 tipping fee covers the costs of running the dump and the region’s Blue Box recycling program. Although the Powers-That-Be are considering solutions, shortfalls in user-pay income at the dump will likely continue. As more and more items are diverted from the garbage stream, less material will end up at Hartland, and fewer fees will be paid. We’ve all experienced other versions of this scenario. We’ve upgraded to energy-efficient appliances, draught-proofed our homes, and brought household energy use down. Yet, our Hydro bills are higher than ever. We’ve switched to water-efficient dishwashers, toilets and showers, landscaped our yards with drought-tolerant plants, and now use less water than ever. Yet, water bills have increased. Even as we recycle more and more, the costs of managing our waste—be it materials that are reused, recycled, composted, turned into fuel, or landfilled—are unlikely to go down. How we pay those costs will change. 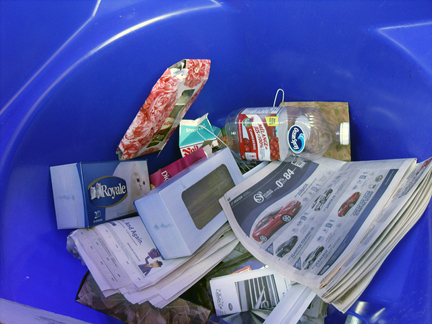 New provincial recycling regulations, coming into effect May 19, will shift costs from taxpayers to producers and, ultimately, to consumers. But as traditional user-pay revenue streams shrink, more and more pressure will be placed on governments (read, taxpayers) to make up shortfalls. Zero waste is a laudable goal. The world is awash in waste. A Texas-sized island of plastic garbage gyres in the mid-North Pacific. Beaches and bays along the coast accumulate refuse brought in on currents and tides. Landfills are filling up. The waste-incineration industry, which zero-waste proponents insist falls outside the reduce–reuse–recycle definition of zero waste, is booming in many countries. But turning towards a zero-waste economy will entail excruciating growing pains…. Read the rest of the editorial at the Victoria Times Colonist….